Background and objectives Mycophenolate mofetil (MMF) is an immunosuppressive drug used in renal transplant patients. Upon oral administration it is hydrolyzed to the active agent mycophenolic acid (MPA). In renal transplant recipients, MMF therapy is optimal when the area under the curve of MPA is 30 to 60 mg·h/L. When MMF doses are adjusted, a linear relationship between dose and MPA exposure is assumed. In this study, the linearity of MMF pharmacokinetics was investigated. Design, setting, participants, & measurements MPA concentration-time profiles from renal transplant recipients cotreated with cyclosporine (n = 140) or tacrolimus (n = 101) were analyzed retrospectively using nonlinear mixed-effects modeling. The correlation between the MMF dose and the pharmacokinetics parameters was evaluated. Results In the developed population pharmacokinetics model MPA clearance and the central volume of distribution were correlated with cyclosporine coadministration and time posttransplantation. The pharmacokinetics of MPA were not linear. Bioavailability decreased with increasing MMF doses. Compared with an MMF dose of 1000 mg (=100%), relative bioavailability was 123%, 111%, 94%, and 90% in patients receiving MMF doses of 250, 500, 1500, and 2000 mg in combination with cyclosporine (P < 0.001); respective values in tacrolimus-cotreated patients were 176%, 133%, 85%, and 76% (P < 0.001). Because of the decreasing relative bioavailability, MPA exposure will increase less than proportionally with increasing MMF doses. Conclusions MMF exhibits nonlinear pharmacokinetics. This should be taken into account when performing therapeutic drug monitoring. Mycophenolate mofetil (MMF) is an immunosuppressive drug used in renal transplant patients. Upon oral administration it is hydrolyzed to the active agent mycophenolic acid (MPA). Although introduced as a fixed-dose drug, therapeutic drug monitoring (TDM) of the MPA area under the MPA concentration versus time curve (AUC) was found to improve clinical outcome. The large interpatient variability in MPA pharmacokinetics at fixed dose and the observation that the risk for acute rejection increases with lower MPA plasma concentrations suggest that a strategy of TDM would improve outcome (1–3). In 2007, Le Meur et al. published the results of the APOMYGRE study, which showed that TDM of MPA reduces the risk of treatment failure and acute rejection in renal allograft recipients without an increase in adverse events and without adding any extra costs (4,5). To provide for clinicians an objective and balanced clinical interpretation of the current scientific evidence on TDM of MPA, recently in this journal a consensus document was published (6). When the MMF dose is adjusted, a linear relationship between dose and MPA exposure, that is, linear pharmacokinetics, is assumed. So far, this linearity has however not been evaluated. This may be caused by the fact that MPA exerts complex pharmacokinetics properties (7). Furthermore, factors complicating the assessment of linear pharmacokinetics are the changes in MPA clearance in the first 3 months posttransplantation, the influence of comedication and the within-patient variability (8,9). In an early dose-ranging study in cyclosporine-treated patients Sollinger et al. compared a 1000-mg MMF two times daily dose with a 1500-mg MMF two times daily dose and found that with the 50% higher dose the AUC was also about 50% higher (12.3 ± 5.8 mg·h/L versus 19.5 ± 13.9 mg·h/L). (10) These results are in accordance with a linear relationship between MMF dose and MPA AUC. In the randomized concentration controlled trial (RCCT), a total of 154 cyclosporine-cotreated adult recipients of a deceased kidney graft were randomly allocated to receive MMF treatment targeted at three predefined MPA AUC values. At day 3 posttransplantation the median-assigned daily doses of MMF were 0.90, 1.90, and 3.40 g and corresponding MPA AUC values were 13.9, 24.6, and 39.1 mg·h/L. In this study, the increase in AUC is less than proportional, which supports nonlinear pharmacokinetics for MMF. With a convex relationship between dose and exposure, an increase of the MMF dose may produce a less than expected increase in MPA exposure. Alternatively, the decrease of MPA AUC may be overestimated when the MMF dose is reduced. Clearly, this may have significant implications for TDM of MPA. In this study a population pharmacokinetics model was developed in which the effect of calcineurin inhibitor cotreatment on MPA disposition and the time dependency of the pharmacokinetics was quantified. The developed population model was used to evaluate the relationship between MMF dose and the pharmacokinetics parameters of MPA. MPA plasma concentration-time profiles obtained from renal transplant recipients treated with MMF and cyclosporine (n = 140) or MMF and tacrolimus (n = 101) were combined and analyzed simultaneously. The data were obtained from the RCCT and the IMPDH-activity study, which were published earlier (1,11). In the RCCT study (1), de novo renal transplant recipients were divided into three MPA AUC target groups. All patients in this study received cyclosporine and corticosteroids as concomitant immunosuppressive therapy. In this study plasma MPA concentrations were measured at days 3, 7, 11, 21, 28, 56, 84, 112, and 140 posttransplantation. On days 3, 7, and 11 posttransplantation, sample times were before dose and 0.33, 0.66, 1.25, 2, 6, 8, and 12 hours after oral intake of MMF. On the remaining occasions, sample times were before dose and 0.33, 0.66, 1.25, and 2 hours after dose. The MMF dose was adjusted on the basis of the measured MPA concentrations. In the IMPDH-activity study (12), de novo renal transplant recipients started with 1000 mg of MMF two times daily, combined with tacrolimus and corticosteroids. The MMF dose was adjusted on the basis of clinical evaluations. In the IMPDH-activity study MPA plasma concentrations were measured at days 6, 21, 49, and 140 after transplantation. On day 6, samples were taken before dose and 0.5, 1, 2, 6, and 12 hours after dose. On the remaining occasions, sample times were before dose and 0.5 and 2 hours after oral intake of MMF. Because of the heterogeneous nature of the data, the pharmacokinetics analysis was performed using nonlinear mixed-effects modeling (NONMEM, Verion VI, level 1.0; GloboMax LLC, Ellicott City, MD). By application of this technique, general pharmacokinetics parameters and their relationship with covariates can be estimated as well as their inter- and intrapatient variability. This technique allows the combined analysis of concentration-time data from patients at several times posttransplantation, with different covariates, and with sparse sampling schemes. Concentration data were logarithmically transformed, and the first-order estimation method was used throughout the entire model-building process. A two-compartment model with lag time (TLAG) and first-order absorption and elimination was fitted to the MPA concentrations, as reported earlier (9,13). Pharmacokinetics parameters were estimated in terms of volume of distribution of the central compartment (Vc), clearance (CL), volume of distribution of the peripheral compartment (Vp), and intercompartmental clearance (Q). Because no intravenous data were available, absolute bioavailability (F) cannot be estimated. As a result, Vc, CL, Vp, and Q correspond to the ratios Vc/F, CL/F, Vp/F, and Q/F, respectively. At some point in the analysis bioavailability was compared for the different doses (see below). In this case the relative bioavailability (Frel) of an MMF dose of 1000 mg was arbitrarily set at 100%. Interpatient variability (IPV) and interoccasion variability (IOV) of the pharmacokinetics parameters were modeled using an exponential error model. Residual variability between observed and predicted MPA plasma concentrations was described using an additional error model. where θpop is the typical clearance in patients using tacrolimus (exponent CsA = 0) and θCsA is the fractional change in MPA clearance in patients cotreated with cyclosporine (exponent CsA = 1). where θΔ is the relative change of MPA CL at day 3 compared with its stabilized value at 6 months posttransplantation and θrate is a first-order rate constant describing the decrease of CL posttransplantation from day 0 to day 180.
in which θpop is the Frel in individuals who received 1000 mg of MMF two times daily, which was arbitrarily set at the value of 1, and θdose is an exponent determining the shape of the relationship. The final model was developed by forward inclusion and backward elimination using the log likelihood test (14). Covariates were introduced one by one. When inclusion of a covariate caused a decrease in OFV >3.84 (P < 0.05), the covariate was considered to be added to the model. 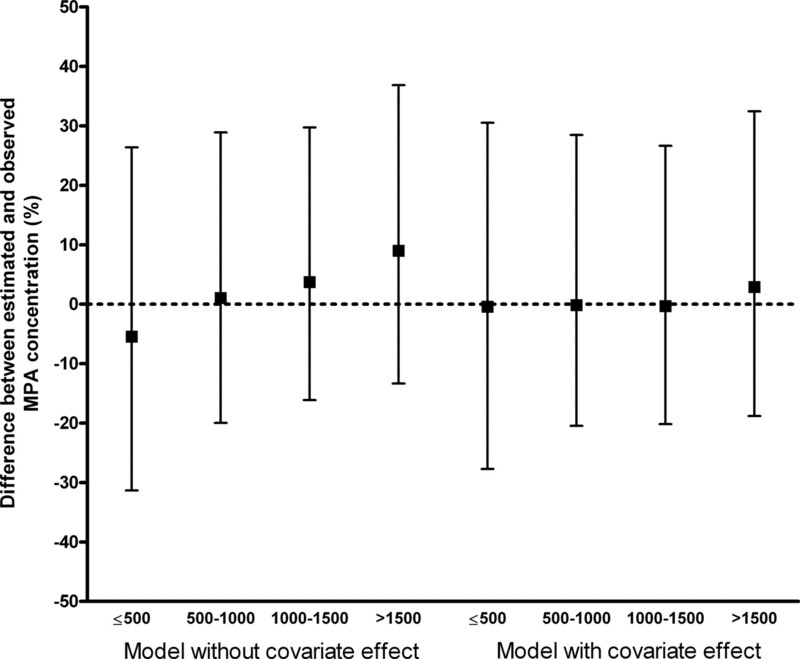 Subsequently, all covariates selected were included in an intermediate model. From this model covariates were deleted one by one. If the elimination of a covariate caused an increase in OFV >10.8 (P < 0.001), then the covariate remained in the model and was considered to be significant. The goodness of the fit was graphically evaluated using goodness-of-fit plots. (15). As an internal validation method, a bootstrap resampling method (16) was applied, using the Wings for NONMEM software (Dr. N. Holford, version 612, March 2007, Auckland, New Zealand). Two hundred bootstrap data sets were generated by sampling randomly from the original data set with replacement. The median and 95th percentile range from the bootstrap analysis were compared with the final model. As an external validation data set, a subset of data from a fixed-dose concentration-controlled (FDCC) trial were available. (17) This database contained 1443 concentration-time curves, obtained from 289 patients. The MMF dose of these patients ranged from 250 to 2500 mg. In 460 of the 1443 occasions the patients were cotreated with cyclosporine. Concentration-time profiles were obtained at day 3, day 10, month 3, month 6, and month 12 posttransplantation. Concentrations of these pharmacokinetics profiles were simulated using the different models derived in this study. The population pharmacokinetics model was developed using 7739 MPA samples originating from 1402 concentration-time profiles obtained from 241 renal transplant recipients. The pharmacokinetics profiles of patients cotreated with cyclosporine (n = 140) and tacrolimus (n = 101) are presented in Figure 1, a and b. Sampling occasions varied from day 3 to day 168 after renal transplantation. MMF doses ranged from 250 to 2200 mg two times daily. Patient characteristics are presented in Table 1. Concentration-time profiles of patients cotreated with cyclosporine (A) and tacrolimus (B). A two-compartment model with first-order elimination adequately described the data. In the basic model, Frel was fixed on 100%. Introduction of IPV for TLAG, ka, Vc, CL, and Frel significantly improved the fit of the model for each parameter (P < 0.001). IOV could be estimated for ka, Vc, CL, and Frel; each improved the model even further (P < 0.001). Equation 1 was used to evaluate possible differences in the pharmacokinetics parameters of MPA between patients receiving either cyclosporine or tacrolimus. Significant differences were observed for CL and Vc. CL was significantly higher in patients receiving cyclosporine, whereas Vc was significantly lower (P < 0.001). Introduction of the differences in CL and Vc between patients cotreated with cyclosporine or tacrolimus improved the fit of the model to the data (P < 0.001). IPV decreased from 44% to 38% for MPA CL and from 124% to 105% for Vc. The respective reductions for IOV were from 9.3% to 7.3% and from 57% to 52%. As a result, part of the IPV and IOV in Vc and CL could be explained by the type of comedication used. A significant decrease in CL and Vc was seen in time during the first 6 months after transplantation (P < 0.001). MPA CL and Vc decreased from 35.3 to 18.6 L/h and from 104 to 49 L in patients cotreated with cyclosporine and from 26.9 to 13.6 L/h and from 297 to 54 L in patients cotreated with tacrolimus (Figure 2, Table 2). The time-dependent phenomena explained some IPV; IPV decreased from 38% to 31% for MPA CL and from 105% to 71% for Vc. Post hoc changes in time posttransplantation of MPA (A) clearance (CL) and (B) volume of distribution of the central compartment (VC). The median and 90th percentile range are presented for patients cotreated with cyclosporine (black) and tacrolimus (gray). Finally, the correlation between MMF dose and the different pharmacokinetics parameters was evaluated. Significant relations with dose were detected for CL, Vp, and Frel (P < 0.05). After combining and backward elimination, only the relationship between MMF dose and Frel remained significant (Figure 3, Table 2). Compared with 1000 mg of MMF two times daily, median Frel (and 95% confidence interval) was 123% (109% to 139%), 111% (104% to 118%), 94% (91% to 98%), and 90% (85% to 96%) in patients receiving MMF doses of 250, 500, 1500, and 2000 mg two times daily, respectively, in combination with cyclosporine (P < 0.001); corresponding values for patients receiving tacrolimus were 176% (134% to 233%), 133% (116% to 153%), 85% (78% to 92%), and 76% (65% to 87%) (P < 0.001). IPV and IOV of relative bioavailability were 41% and 24%, respectively. The goodness-of-fit plots of the final model (Figure 4) showed no structural bias. Correlation between MMF dose and relative bioavailability (Frel). Patients cotreated with cyclosporine are represented in black and patients cotreated with tacrolimus are in gray. Goodness-of-fit plots of the final model. Model-predicted MPA concentration versus observed MPA concentration (A), individual-predicted MPA concentration versus observed concentration (B), and weighted residuals versus time (C). The solid line in (A) and (B) is the line of identity. The solid line in (C) is the line for x = 0. Patients cotreated with cyclosporine are represented in black and patients cotreated with tacrolimus are in gray. The median estimates and 95th percentile range from the bootstrap procedure were similar to the population estimates of the final model, demonstrating the accuracy of the model (Table 2). In the external validation, data were simulated using the final model, taking into account the relationship between dose and Frel, and the model without this correlation (Table 2). The differences between the predicted and observed concentrations for both models are graphically presented in Figure 5. For the final model, no trend in the deviation of the concentration is seen over the whole MMF dose range. In contrast, an underestimation of the concentration after a low MMF dose and an overestimation after a high MMF dose are seen when the relationship between dose and Frel is not taken into account. External validation. Median and interquartile range of the difference between the estimated and observed MPA concentrations in the external validation data set. The differences are represented for several MMF doses, after estimations with the final model (right) and the model in which the correlation between MMF dose and bioavailability is not included (left). The exponents in equation 3 were −0.15 for cyclosporine and −0.41 for tacrolimus. This indicates that bioavailability of MMF decreases when doses increase. 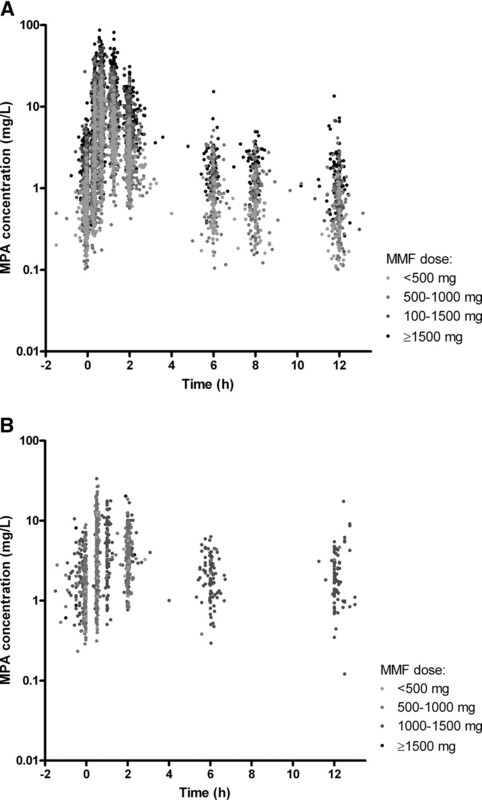 The correlation between MMF dose (“administered MMF dose”) and MMF dose multiplied by Frel (“relative MMF dose”) is shown in Figure 6. For instance, a patient receiving 500 mg of MMF cotreated with tacrolimus exhibits a MPA exposure corresponding to 665 mg of “relative MMF dose”. When exposure has to be doubled to 1330 mg, a MMF dose of 1620 mg has to be administered (Figure 6). In this case, to double the MPA exposure, the administered dose needs to be increased to 3.2 times its original value. Conversion from administered MMF dose to the relative MMF dose, corrected for relative bioavailability (Frel). The median and 90th percentile range are presented for patients cotreated with cyclosporine (black) and tacrolimus (gray). A population pharmacokinetics analysis of MPA was performed in renal transplant recipients, who were followed for 6 months posttransplantation. Differences were seen in MPA CL and Vc between patients cotreated with either cyclosporine or tacrolimus (P < 0.001). The pharmacokinetics of MPA were time-dependent with decreasing CL and Vc posttransplantation. Finally, in the developed model a relationship between MMF dose and relative bioavailability, Frel, was observed. Because of the decrease of Frel with rising MMF doses, an increase of the MMF dose will produce an increase in MPA AUC that is less than proportional. The basic model and estimated pharmacokinetics parameters of the present model were comparable with those of previously published models for MPA in renal transplant recipients (18–20). The pharmacokinetics of MPA are dependent on the calcineurin inhibitor that is coadministered. MPA CL was increased in patients cotreated with cyclosporine (19.2 L/h) compared with tacrolimus-cotreated patients (17.0 L/h). The enterohepatic recirculation is decreased by inhibition of the multidrug resistance–associated protein 2 (MRP2) transporter by cyclosporine. MRP2 is responsible for the excretion of MPAG in bile, which can be reabsorbed in the gut as MPA. (21) The intact enterohepatic recirculation contributes to MPA exposure, and explains the reduced clearance, in tacrolimus-cotreated patients. Time-dependent changes in MPA pharmacokinetics cause at least a 30% to 50% increase in MPA AUC during the first weeks posttransplantation (22). The decrease in Vc might be explained by the increase in renal function and albumin levels in time posttransplantation. (9,18) MPA CL decreased from 35.9 to 19.2 L/h for cyclosporine and from 25.5 to 17.0 L/h for tacrolimus-cotreated patients. This is caused by a combination of improving renal function, increasing albumin levels, increasing hemoglobin, and decreasing cyclosporine before dose target concentrations during the first 6 months posttransplantation (8). Because of inclusion of cyclosporine cotreatment and time posttransplantation as covariates, the pharmacokinetics model can be used in the whole population. There is no need to develop separate models for the different periods after transplantation. Compared with separated models for each covariate, this integrated model includes as much information as possible, allowing multivariate analysis and increasing the statistical power. Because of the known decrease in MPA clearance over time, the needed MMF dose to reach a certain AUC will decrease. However, in this study the range of the MMF dose varies from at least 300 to 2200 mg two times daily for every period. Although the developed model takes these changes in time into account, a significant correlation between MMF dose and bioavailability was still detected for the whole period, also when the different periods posttransplantation were analyzed separately. The population pharmacokinetics analysis demonstrated that bioavailability was not constant over the studied dose range of MMF. Bioavailability decreased significantly with rising MMF doses. As a result, MMF exhibits nonlinear pharmacokinetics. The correlation between MMF dose and bioavailability was confirmed in the external validation, where concentrations were predicted in an independent data set. The decrease in bioavailability with higher doses may be caused by a saturable absorption process of MPA from the gut. Hereby, a limited amount of MPA can be absorbed when high doses are administered. Another possible explanation might be saturation of the enterohepatic circulation, which is responsible for the reabsorption of MPAG in the gut as MPA. At higher doses, less MPAG is recirculated and more will be excreted by the kidney, producing less exposure to MPA. Consequently, the effect of this mechanism will be less in patients treated with cyclosporine, which may explain the slightly different relationship between MMF dose and Frel in cyclosporine-cotreated patients compared with tacrolimus-cotreated patients. More support for our findings comes from a recent trial that investigated whether an intensified dosing regimen of enteric-coated mycophenolate sodium (EC-MPS) resulted in a higher MPA AUC compared with standard dosing. (23) In this cyclosporine-based study, treatment with 2724 mg of EC-MPS (the equivalent of 2000 mg of MMF) resulted in a MPA-AUC that was only 37% higher compared with treatment with 1440 mg of EC-MPS (42.8 versus 31.3 mg·h/L). Figure 6 may be used to calculate the MMF dose needed for a certain change in MPA AUC in an individual patient. With a dose of 1000 mg of MMF two times daily and a MPA AUC of 20 mg·h/L, the patient is underexposed. Doubling the dose to 2000 mg of MMF (to obtain an AUC value of 40 mg·h/L) will result in a “relative MMF dose” of 1520 mg in tacrolimus- and 1800 mg in cyclosporine-cotreated patients. This increase in MMF dose will on average result in an AUC of 30 mg·h/L for the tacrolimus-cotreated patient and 36 mg·h/L for the cyclosporine-cotreated patient. Clearly, decreasing bioavailability may produce underexposure to MPA when the MMF dose is increased and this may have consequences for the efficacy of MMF therapy. The bioavailability of MPA has been improved through ester derivatization to MMF (24). MMF absorption has been reported to be almost complete. In healthy patients, bioavailability after single-dose oral administration of 1.5 g of MMF was 85.7% for the MPA AUC0–24 and 93.3% for the MPA AUC0–∞ in comparison with the intravenous formulation (25). However, MMF bioavailability seems to be decreased to 48.5% in liver transplant patients treated with 1 g of oral MMF two times daily (26). Also, in hematopoietic stem cell transplant recipients treated with 1 g of MMF in combination with cyclosporine, a decreased and highly variable bioavailability was seen (F = 72.3%, range 20.5% to 172%) (27). In combination with our findings, it would seem that changes in bioavailability might contribute to the variability seen in patients treated with MMF. In conclusion, the population pharmacokinetics analysis of MPA demonstrated that bioavailability of MMF is not constant. Increasing the MMF dose will produce a less than proportional increase of the MPA exposure. This should be taken into account when performing TDM.